Tucumcari was an unexpected stop on our way to Gallup, New Mexico, where there was to be a rodeo which Linda and I thought would be fun for the children and our teenage babysitter. However, before we got to Gallup, our car developed another mechanical problem, and so we found ourselves in Tucumcari. The chances are that you’ve never heard of Tucumcari, and until that time neither had I. Since then, whenever I’ve seen it mentioned in the press (at least two times and once in a movie!) it is only referred to as the most out-of-the-way and anonymous city in the United States, where nothing ever happens because it is simply too hot for people to be very active. The outstanding architectural feature of this city was a group of grain silos at one end of town, all of them painted different shades of pink. The tallest building in town was probably two stories high, although I can’t remember any that tall. The rest of Tucumcari was hot, flat and treeless, but it did have a motel, a diner, and a movie theater. It is likely that it also had a church, but I don’t remember it. It also had a garage, the owner of which told me that it would take several days to effect the needed repairs. 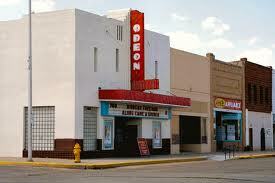 I got him down to two days, and so for two days we had to find something to do in Tucumcari. Don Knotts was a local favorite. . . The only entertainment available was going to the movies, and we just happened to be in time for a Don Knotts film festival, days of nothing but Don Knotts movies! I think that Linda and the kids may have watched a couple of them. I couldn’t bring myself to do it. I was still in recovery from a Jerry Lewis film festival at an unscheduled stop at Gander Air Force Base some nine years earlier, while on our honeymoon to Europe on an economy Icelandic Air flight. Being served greasy, powdered eggs for breakfast just intensified the nightmare, and made it more difficult to forget the experience. However, we were in Tucumcari on vacation, and soon enough, it was with great pleasure that we left it to resume our trip to Gallup, New Mexico. Gallup was larger and busier than Tucumcari. There were actually people out in the streets (although not many), most of them Indians (yes, I know they are called Native Americans now-a-days, but this was then), wearing straw or black, ten-gallon hats. Don’t believe I saw anyone wearing a feather headdress, but there might have been some traditionalists. There was also a thriving market in, elaborately-worked, Navajo silver jewelry, and Linda and I both bought watchbands. For some reason I couldn’t quite understand, it would seem that Navajos were really into watchbands. Indians wore wrist watches in the Old West? The rodeo was also fascinating. Surprisingly, most (if not all) of the “cowboys” were Indians. Riding wild horses and bulls didn’t seem to be an easy or pleasant occupation, as in these contests between man and beast, the beasts generally won, and the men found themselves suddenly and violently deposited in the dust. We had been on the road nearly seven weeks, and while we’d all had a very good time, we were also looking forward to sleeping in our own beds again. After Gallup, we headed home.